(Nanowerk News) Scientists combined observations from two NASA missions to check out the moon’s lopsided shape and how it changes under Earth’s sway – a response not seen from orbit before. The team drew on studies by NASA’s Lunar Reconnaissance Orbiter, which has been investigating the moon since 2009, and by NASA’s Gravity Recovery and Interior Laboratory, or GRAIL, mission. Because orbiting spacecraft gathered the data, the scientists were able to take the entire moon into account, not just the side that can be observed from Earth. “The deformation of the moon due to Earth’s pull is very challenging to measure, but learning more about it gives us clues about the interior of the moon,” said Erwan Mazarico, a scientist with the Massachusetts Institute of Technology in Cambridge, Mass., who works at NASA’s Goddard Space Flight Center in Greenbelt, Md. The lopsided shape of the moon is one result of its gravitational tug-of-war with Earth. The mutual pulling of the two bodies is powerful enough to stretch them both, so they wind up shaped a little like two eggs with their ends pointing toward one another. On Earth, the tension has an especially strong effect on the oceans, because water moves so freely, and is the driving force behind tides. Earth’s distorting effect on the moon, called the lunar body tide, is more difficult to detect, because the moon is solid except for its small core. Even so, there is enough force to raise a bulge about 20 inches (51 centimeters) high on the near side of the moon and similar one on the far side. The position of the bulge actually shifts a few inches over time. 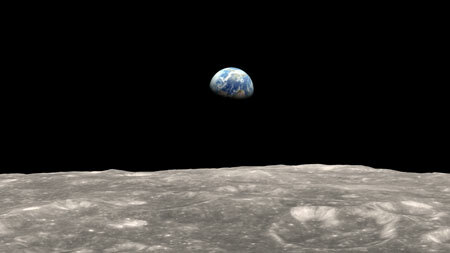 Although the same side of the moon constantly faces Earth, because of the tilt and shape of the moon’s orbit, the side facing Earth appears to wobble. From the moon’s viewpoint, Earth doesn’t sit motionless but moves around within a small patch of sky. The bulge responds to Earth’s movements like a dance partner, following wherever the lead goes. A few studies of these subtle changes were conducted previously from Earth. But not until LRO and GRAIL did satellites provide enough resolution to see the lunar tide from orbit. To search for the tide’s signature, the scientists turned to data taken by LRO’s Lunar Orbiter Laser Altimeter, or LOLA, which is mapping the height of features on the moon’s surface. The team chose spots that the spacecraft has passed over more than once, each time approaching along a different flight path. More than 350,000 locations were selected, covering areas on the near and far sides of the moon. The researchers precisely matched measurements taken at the same spot and calculated whether the height had risen or fallen from one satellite pass to the next; a change indicated a shift in the location of the bulge. A crucial step in the process was to pinpoint exactly how far above the surface LRO was located for each measurement. To reconstruct the spacecraft’s orbit with sufficient accuracy, the researchers needed the detailed map of the moon’s gravity field provided by the GRAIL mission. “This study provides a more direct measurement of the lunar body tide and much more comprehensive coverage than has been achieved before,” said John Keller, LRO project scientist at Goddard. The good news for lunar scientists is that the new results are consistent with earlier findings. The estimated size of the tide confirmed the previous measurement of the bulge. The other value of great interest to researchers is the overall stiffness of the moon, known as the Love number h2, and this was also similar to prior results. Having confirmation of the previous values – with significantly smaller errors than before – will make the lunar body tide a more useful piece of information for scientists. “This research shows the power of bringing together the capabilities of two missions. The extraction of the tide from the LOLA data would have been impossible without the gravity model of the moon provided by the GRAIL mission,” said David Smith, the principal investigator for LRO’s LOLA instrument and the deputy principal investigator for the GRAIL mission. Smith is affiliated with Goddard and the Massachusetts Institute of Technology. LRO is managed by Goddard for the Science Mission Directorate (SMD) at NASA Headquarters in Washington. NASA’s Jet Propulsion Laboratory in Pasadena, Calif., managed the GRAIL mission for SMD.